James McQuillan knew he was a dead man. He knew the instant the snake struck. A large king brown, a good six feet in length. He didn’t know how long his death would take or how much pain might accompany it, but he was aware the sight would not be pretty. ‘Get back to the homestead, Emily, and fetch help,’ he said. Quelling as best he could the fear that accompanied his awful knowledge, he kept his voice authoritative: ‘Hurry along now, there’s a good girl.’ There was no point in her fetching help, he would be dead long before her return, but if his daughter were to witness his death she might panic and lose her way home. It was imperative he give her a sense of purpose. Legs outstretched on the dusty red earth, he leant his burly frame back against the rock, the very rock with the very crevice from which the snake had darted its head. The very rock he’d steadied his hand upon while leading the way down to the rock pool. He’d so wanted to share with his daughter this oasis, this perfect gift of nature nestled in the desert. A place of such beauty, where white-trunked gums grew stark and ghostly out of ochre-red rocks that walled a pristine lagoon of blue. He cursed himself now. How could he have been such a fool? He was a dead man, and his daughter’s life was in jeopardy. Emily should be safely home in Adelaide. He should never have brought her to this wilderness. Sixteen-year-old Emily stared down at her father, dumbstruck with fear. She had seen the snake. Light brown in colour with a flat cobra-like head, it had struck with such speed and ferocity and then disappeared so quickly that she hadn’t even screamed. Now, upon her father’s instruction, she was galvanised into action. 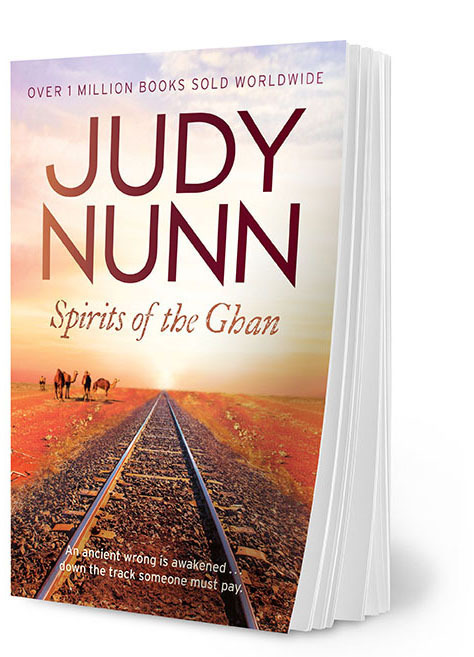 Tell us about your new book, Spirits of the Ghan. It’s about the completion of the last leg of the Ghan Railway from Alice Springs to Darwin. Construction to Alice was completed in 1929, but the final link to Darwin was never finished. When it finally opened in 2004, it was the long overdue completion of a dream. The project brings together Matt, a young surveyor, and Jess, an Aboriginal/Irish woman who is a negotiator working with the indigenous community in the Red Centre. Both Jess and Matt have been raised in the city, yet they come from very different backgrounds. There’s a collision of cultures and some interesting family dynamics. I like Jess very much, she shows great strength and yet she’s vulnerable. In the beginning Jess is nearly crushed by some bad experiences and she has to dig deep to survive them. What drew you to the setting of Australia’s Red Centre? This great rail project involves men literally blasting their way through the land to lay the line, and it has an impact on everyone – those who work on it and those who live there. And there’s an intriguing spiritual element. Not that I’m particularly spiritual, but in these remote areas you really do get a very strong spiritual feeling from the land itself. What first sparked the idea for this novel? I’d wanted to set a book in the Red Centre, so that was part of it, but I took a trip on the Ghan Railway. Looking at those endless steel tracks made me think about what they represented, not only as a great engineering feat, but how they impacted this ancient land and its culture. What was your goal for the book, when you first set out to write it? I don’t write to send messages, I set out to tell a good story. But I always like to have a moral core to the book. That helps inspire me. I wanted people to think about what their beliefs are – do they believe in an afterlife? Tell us about your trip. What’s it like to travel on the Ghan? It can be desolate in parts, but it has a beauty all of its own - you’ve never seen a sunset like a desert sunset. It’s regarded as one of the great railway trips. It takes three days and two nights to travel 2,979 kilometres from one end to the other, and it’s lovely, luxurious… It’s like the Orient Express. Can spending time in such a powerful place change a person? One of my main characters, Matt, set outs to do something highly risky. You think, ‘Crikey, are you going to be able to pull this off?’ But I found myself picking up this can-do attitude. It’s the Territory, you can get away with a lot there! Researching the real-life story behind the railway must have been fascinating. My cousin, who is a surveyor, and two of his mates were fantastically helpful, and I spent a lot of time in the Ghan Museum in Alice Springs. It was the second biggest civil engineering project in Australia, after the Snowy Mountains scheme. I don’t go into any of the technicalities in my book, but I did discover some interesting facts, things that made me go, ‘Wow, I didn’t know that!’ Like how they build the transitional curves in railway lines. They have to be gradual, no sudden turns. Things you never think about. Tell us about how you write, when you’re at home. Where do you write? Do you prefer to play music, or to work in silence? Silence. I have an office at home, and it’s the best room in the house. I live on the coast and look out over the bay to bobbing boats. It’s very serene.